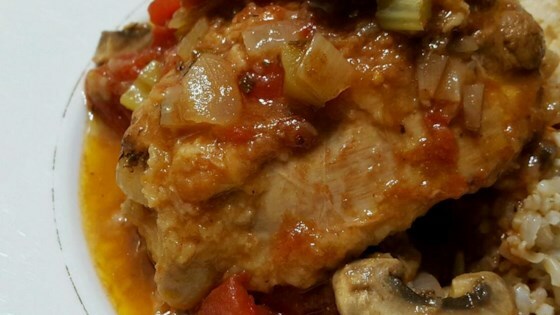 "A chicken dish fit for a gondola ride - 'Veneto' means this recipe originated in Venice, Italy! Serve with rice." Dredge chicken lightly in flour. Heat oil over medium-high heat. Fry chicken pieces briefly, turning to brown evenly. Add onion and celery; cook 1 to 2 minutes. Stir in wine and chopped tomatoes. Season with oregano, and salt and ground pepper to taste. Cover, reduce heat, and simmer gently for 30 minutes, turning pieces once. Pour in balsamic vinegar and mushrooms, and cook another 5 to 10 minutes. Fantastic dish! Sophisticated taste, make sure to have rice to go along with dish, we thought we'd detour from the recipe and have fresh baked bread, it just didn't cut it for us. My husband and I thought it lacked some flavor. Next time I might try adding garlic to help enrich the taste. Served it over rice. I almost think it tasted better as leftovers. good flavor and very moist. i think i put too many mushrooms in mine, but otherwise this was a great dish.